Full Photo Edit mode offers bundles of tools that you can use to edit your images, from correction tools for fixing color and clarity to filters, layers, and more for changing existing photos or creating entirely original images from scratch. But all these tools also make Full Photo Edit mode complex. From the initial Welcome screen. Click Edit and open a photo. Your Elements window appears in Full Photo Edit mode. From the Organizer. Click a photo (or several photos) and choose Full Photo Edit from the Fix drop-down menu. The selected file(s) open in Full Photo Edit mode. 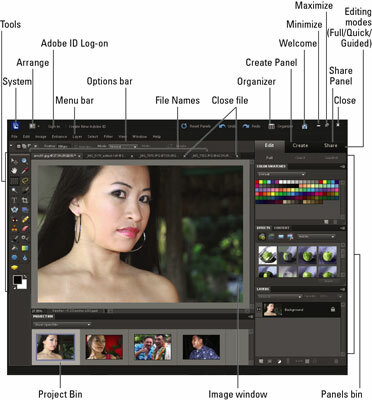 You can also open a contextual menu on a photo in the Organizer (right-click to make this menu appear or Ctrl-click the Mac with a one-button mouse) and choose Edit with Photoshop Elements from the menu. Notice that filenames appear as tabs above the image window. To bring a photo forward, click the filename. To close a photo, click the X adjacent to the filename.